Investors are breathing a sigh of relief. One of the markets biggest stocks, Apple (NASDAQ:AAPL), and one of its most traded, Advanced Micro Devices (NASDAQ:AMD), are both moving higher on earnings. Further, the Fed is keeping interest rates unchanged. All of this has been enough to push stocks higher on Wednesday. Bouncing higher after reporting its first-quarter results, Apple is looking better and better. 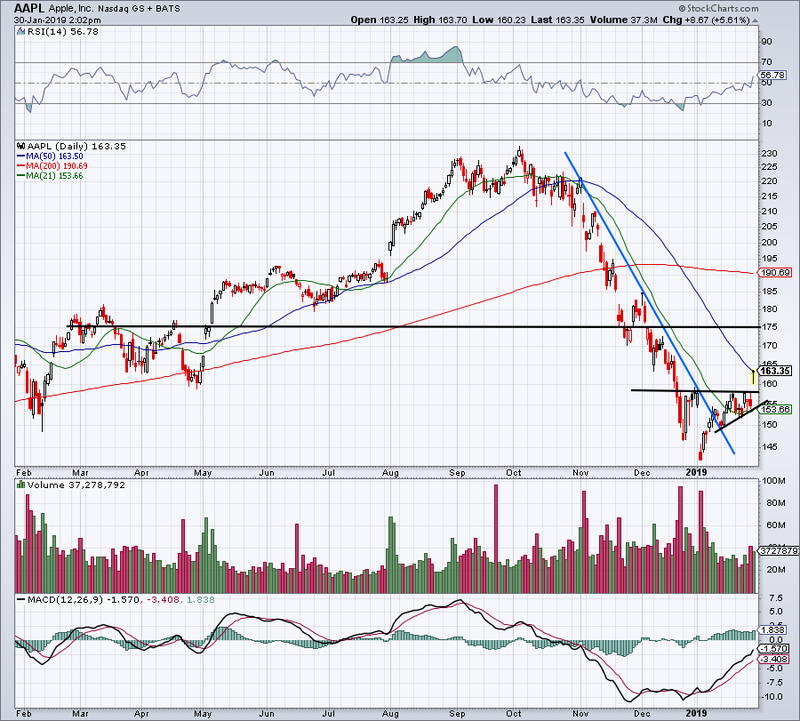 It broke out of that nice little consolidation zone it had going on and is now running into the 50-day moving average. If the 50-day acts as resistance, look to see that Apple holds up over that $157.50 to $160 zone, which was prior resistance during its consolidation. If the 50-day gives way, a rally up to $175 is possible. We got a false breakdown in AMD stock the day before earnings, largely thanks to the warning and subsequent decline from Nvidia (NASDAQ:NVDA). As we laid out ahead of time, that’s exactly why we play the reaction rather than guess on what will happen. Up over 18% presently, AMD is soaring on its earnings results. But now what? At $23 it hits the gap down level from October. However, this gap was filled when AMD stock rallied in late-November. Therefore, let’s look to see how AMD handles $23. If it pushes through with little issue, I want to see how it does with the $23.75 to $24 level. For now, expect it to act as resistance. But with the Fed playing ball and momentum working in AMD’s favor, we’ll just have to see. 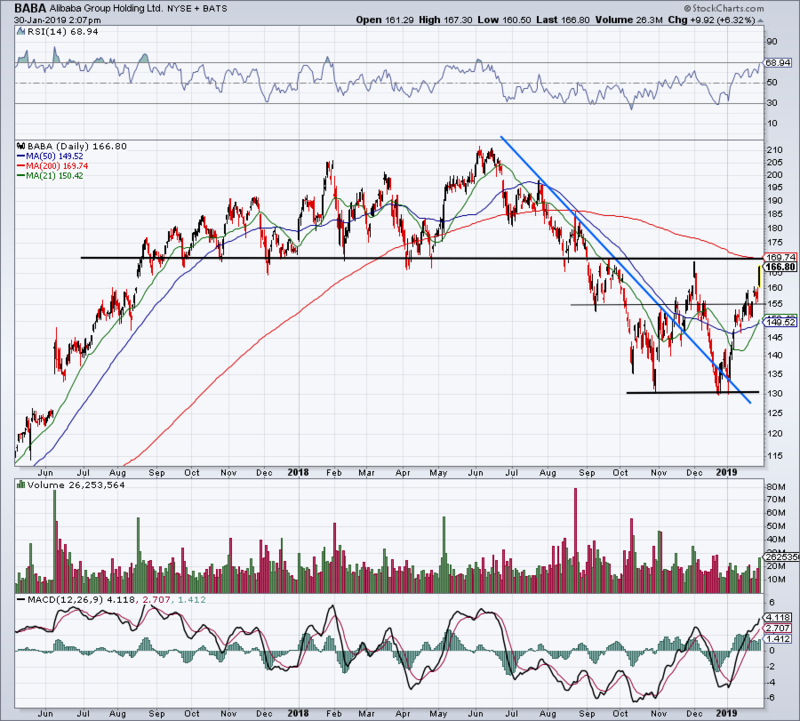 Like Apple, Boeing (NYSE:BA) is exploding higher after a beautiful consolidation just under $365. Thanks to stellar earnings, Boeing stock ripped higher to $390, running into its highs September. My gut says it will push through given the high-quality update investors just received. 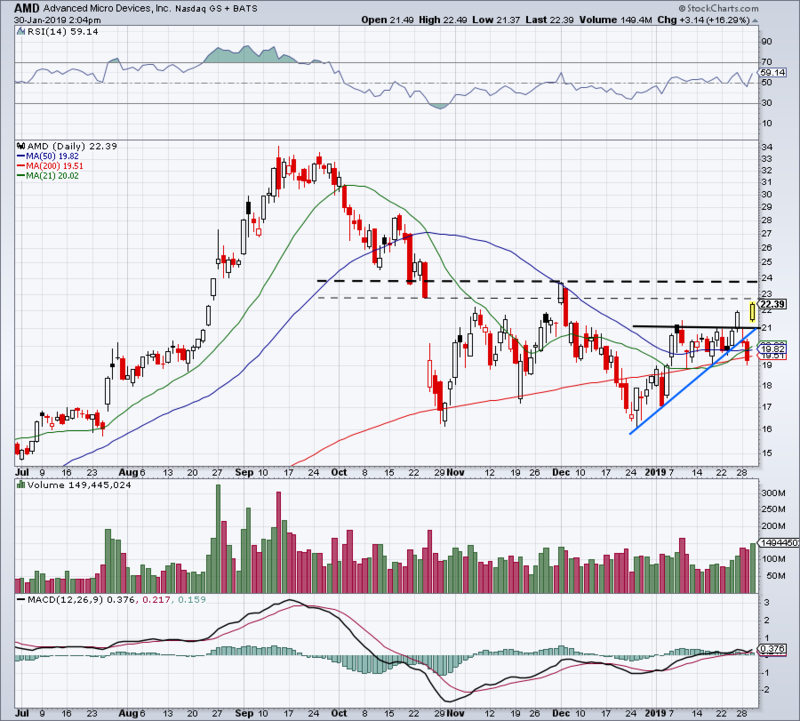 Look to see if BA pushes through on Thursday or if it consolidates just below and tries later on. Should it fail to push through resistance and a double top keeps BA in check, I want to see $375 to $370 hold as support. After receiving a buy rating and $130 price target from Goldman Sachs, Take-Two Interactive Software (NASDAQ:TTWO) shares are higher by about 2%. They’ve been consolidating nicely near this $98 level, giving bulls a great risk/reward. This setup could go one of two ways. 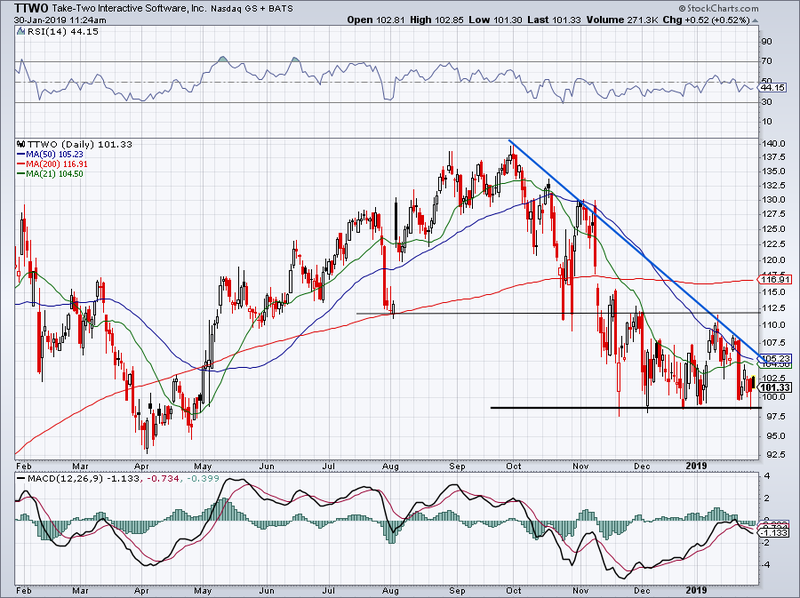 Either TTWO can breakout over the 21-day, 50-day and downtrend resistance (blue line) or it can break below support. If it breaks out, look for a rally up to $112. On a breakdown, look for a test of its April lows. Alibaba (NYSE:BABA) stock is jumping after the company reported stronger-than-expected earnings. Now though, its stock faces a big test. Shares are running right into the 200-day moving average, as well as $170, which has been resistance for the past few months after long serving as a buoy of support. Now what? Short of a breakout through resistance, I don’t like BABA from the long side right here — despite its attractive fundamentals. It’s still prone to negative trade-war headlines and I would like it more on a pullback now that we’ve got such a positive update. Let’s see how BABA handles $170. Bret Kenwell is the manager and author of Future Blue Chips and is on Twitter @BretKenwell. As of this writing, Bret Kenwell is long AAPL and NVDA. The post 5 Top Stock Trades for Thursday: AAPL, AMD, BA appeared first on InvestorPlace.